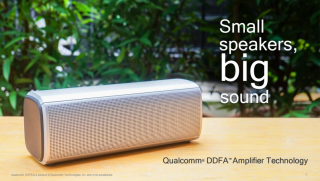 Qualcomm amp platform promises better sound from wireless speakers | What Hi-Fi? Future affordable wireless speakers: small form, big sound? Qualcomm is on a mission to improve the sound of affordable wireless speakers - and it thinks it has the chip to do it. Most speakers we carry around today or that sit on our mantelpieces use Class D amplification, which, like most things in tech, has both benefits and drawbacks: it offers high power efficiency without requiring big power supplies or heatsinks, but ultimately tends to sound inferior to linear Class A amplification designs. Class D is becoming more and more ubiquitous, with superior-sounding linear alternatives typically saved for higher-end products. Qualcomm – the global player behind mobile processing chips and technologies such as aptX Bluetooth – has seen room for improvement here. ­Its goal is to improve the sonic capability of Class D and make it more commercially viable; to make even smaller, more affordable speakers and amplifiers sound bigger and better. It’s an objective that in theory is easy to get behind. To that end, the company has today announced a new single-chip amplifier solution (CSRA6640) that utilises the next-gen version of Qualcomm’s DDFA (Direct Digital Feedback Amplifier) technology. That technology has, for over ten years, been developed to combine the power efficiency advantage of class D amplifiers with the sound quality of traditional linear amplifiers. Essentially, the patented closed-loop digital architecture – found in the likes of the Sonos Amp, BlueSound PowerNode and Denon PMA-60 – is designed to reduce damaging noise and jitter compared to traditional Class D amplifier designs. It also aims for better performance at higher volumes. Sharing (and building on) the features of Qualcomm’s previous-gen DDFA efforts, the new CSRA6640 amplifier platform (now a single chip as opposed to multiple parts) delivers configurable digital processing, support for PCM 384KHz and DSD128 formats and hi-res filters and equalisers, power management features, and an integrated output stage (2 x 20-watt RMS or 1 x 40-watt RMS at 4/8ohms). Qualcomm says the CSRA6640 chip's single-form size will fit in the smallest of products, and will allow manufacturers to reduce their costs as they will not need to purchase additional external components. While Qualcomm's DDFA is already housed in a number of mid-range products, such as those mentioned above, this new chip hopes to target more affordable products too. So, will this new chip map out a near-distant future of better sound quality at the lower end of the powered speaker, soundbar and amplifier market? Will this mean even more competition at budget price points? Qualcomm would certainly hope so - and it sounds good to us.